The novel is an international crime thriller dealing with the ingenious theft of nuclear material and the bloodcurdling use thereof. The unthinkable has happened. An environmental organization warned the world against it. Still, nobody believed that it would turn out like this. But Donald Morse proves everyone wrong. Defying all security measures, he manages to steal a shipment of nuclear material from a cargo ship destined for Japan’s nuclear power reactors. Could anything be worse than this scenario? Perhaps the fact that Donald Morse knows that South African scientists developed extremely dangerous nuclear weapons during the apartheid years, weapons that the world thought were not possible to construct. Donald has information where these deadly weapons are hidden – and he has plans to get them out. Ken Palmer is sent by the FBI to find Donald Morse and to arrest him. To complicate matters, Donald keeps Ken’s ex-girlfriend, Karen Visser, a television journalist, as a hostage. Ken finds an unexpected ally in the form of Mandla Dladla, an out-of-work local journalist, but Ken still has to deal with traitors from within as well as onslaughts on his life. He eventually discovers the real spine-chilling reason for Donald’s need for the nuclear weapons and he realizes that Donald has to be stopped in any way possible. 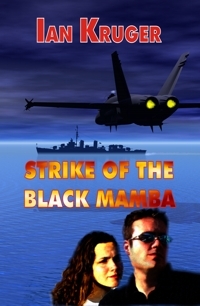 “Strike of the Black Mamba” is now available for ordering on Amazon.com. For many other ordering options, please visit the book’s page on CruGuru.com. South African readers can order the book from wantitall.co.za. The price that wantitall.co.za quotes includes all shipping and duties. It is a lot more expensive to get the book in South Africa via Amazon.com. South African readers can also purchase the book from Kalahari.net. However, the best option for South African readers would be to order locally from Crink. The price is just R119.95 and excludes shipping of R32.00. Read an excerpt of the book, consisting of the first 9 chapters (150 pages). The excerpt is in PDF format (445kb). Watch the book’s trailer video on YouTube!